Vineyard House - Stitch this charming scene beautifully rendered by Laura. The guide includes silk ribbon and canvas applique. 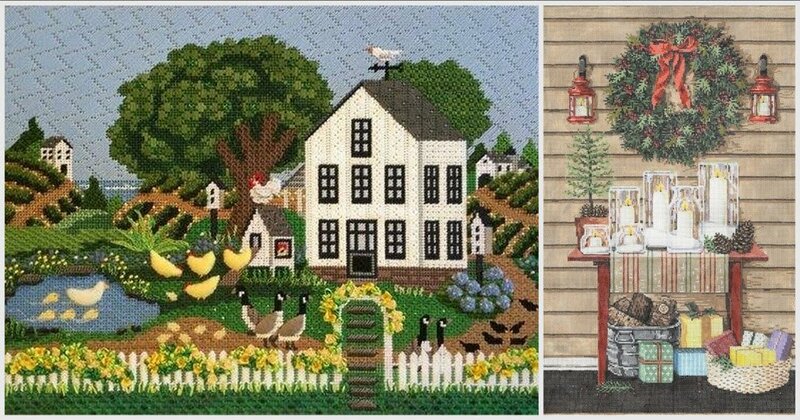 Learn amazing stitches for the landscape and architectural features. Christmas Glow - Stitch from Laura's beautiful guide for this stand-out piece from Sandra Gilmore. The finished framed piece includes LED lights that really bring the flickering candles to life. Note - Choosing this class pays for the class fee deposit only. We will contact you for credit card information for the balance of your class fee, your canvas, stitch guide, thread kit, stretcher bars. Instructor Bio: Laura Taylor is a nationally renowned stitch guide designer and teacher. She teaches regularly at TNNA and throughout the US. We are lucky to have Laura join us a couple of times each year!